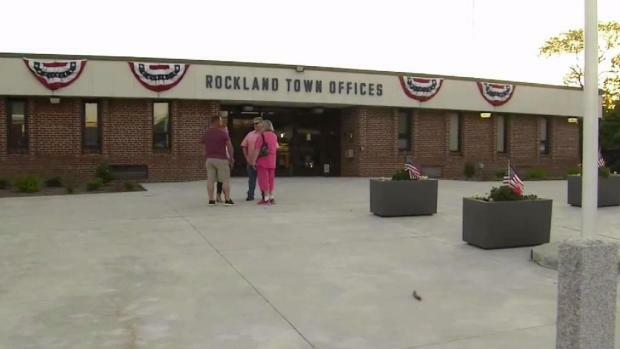 A town administrator in Rockland, Massachusetts, was accused of sexual misconduct by a selectwoman; after an investigation, officials determined that selctwoman was actually the aggressor. Rockland Town Admin. Allan Chiocca has been on administrative leave since May pending an investigation into sexual misconduct allegations. His accuser, Rockland Selectwoman Deirdre Hall, has since resigned following revelations she allegedly pressured him for sexual favors. With Hall gone and Selectman Ed Kimball allegedly involved in the scandal, not enough votes are available to take action against Chiocca. Town officials in Rockland, Massachusetts, agreed Tuesday not to take disciplinary action against the town administrator after an investigation cleared him of sexual misconduct allegations, revealing that his accuser was actually the alleged aggressor. Rockland Town Counsel John Clifford advised the board of selectmen that the town's charter would require the votes of four of the town's five selectmen to initiate action against Allan Chiocca, who was placed on administrative leave in May following "serious allegations regarding potential misconduct." However, Clifford said only three members were "present and able to vote on this matter." "On the advice of counsel, the Board deferred taking any action against Mr. Chiocca at this time," Clifford wrote. One former member, Selectwoman Deirdre Hall, accused Chiocca of participating in inappropriate behavior toward her. She resigned last week after an investigation determined that she actually used her position to pressure Chiocca into sexual activity. The town released surveillance footage from the night in question. According to the results of an investigation, Rockland Town Administrator Allan Chiocca was falsely accused of sexual misconduct, and the selectwoman who accused him was actually the aggressor. Selectman Ed Kimball was also allegedly involved with Hall, as well as the coverup. "He started the investigation and was lying to us from the beginning," fellow Selectman Larry Ryan said last week. Kimball answered very few questions from reporters, but he said he's not going anywhere. "I have no intention to resign," he said after the investigation's findings were released. "I will complete my term, and my term is up in April."